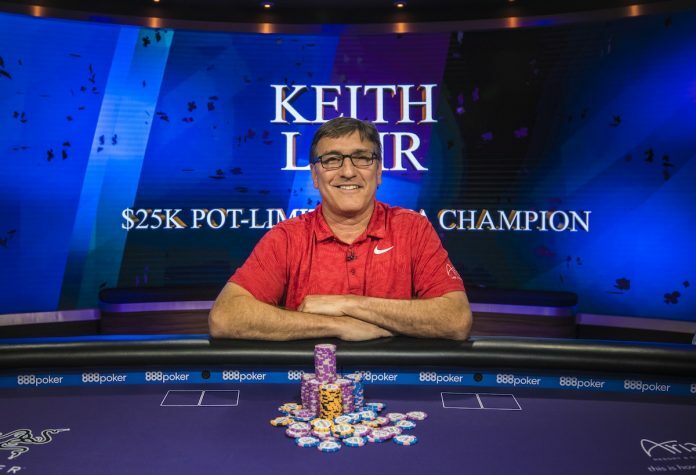 The final table of Event #3 ($25,000 Pot Limit Omaha) of the 2018 Poker Masters was headlined by Brandon Adams making his third straight final table appearance but by the end of it all, two-time World Series of Poker bracelet winner Keith Lehr stood tall to claim the win. Adams, who finished fourth in Event #1 and then won Event #2, and Lehr were joined at the final table by Dan Shak, Ben Yu, Jonathan Depa, and Isaac Haxton. It took nearly three hours before the first elimination on Monday. From UTG, Dan Shak raised to 140,000 with before Jonathan Depa re-raised to 480,000 with and Shak called all in. The board ran out to eliminate Shak in sixth place. Even though he came into the final table with the second biggest chip stack, Brandon Adams fell short in his run for back-to-back titles thanks to Ben Yu. Action folded to Yu on the button and he raised to 175,000 with and Adams called from the big blind with [js . Adams then checked after the flop and Yu bet 125,000. Adams tanked for nearly a full minute, using a time bank in the process, before moving all in for 715,000. Yu called. The turn and river actually improved Yu’s hand and eliminated Adams. It took almost a full hour before the next elimination happened. Isaac Haxton raised to 280,000 from the button with and Jonathan Depa defended the big blind with . The was followed by a bet from Depa and an all in call from Haxton. The turn was the and the river was the to give Depa runner-runner two pair to send Haxton out in fourth. Ben Yu lasted just one more hand. Yu raised to 280,000 with on the button and Lehr defended his big blind with . Lehr checked the flop to Yu and then snap-called Yu’s shove. The turn was the and the river was the and Yu was out in third. Heads-up play started with Depa holding less than a single big blind more than Lehr and took just 20 minutes to get to a winner. Now down 3-1 in chips, Depa completed from the button with and Lehr checked his option with to send both players to a flop. Lehr bet 240,000 and Depa raised to 720,000. Lehr announced he was all in and Depa called and found out he was ahead with two pair. The turn flipped the script though and gave Lehr a bigger two pair. The river changed nothing and Lehr eliminated Depa to claim his first career Poker Masters title. With his fifth-place finish, Adams continues to lead the overall points standings for the Poker Masters title and accompanying Purple Jacket.